Remember back in the good old days (three months ago) when I was all inordinately excited about a cheap-o DVD set that included the sadly underappreciated killer bat flick NIGHTWING? Those were good times. 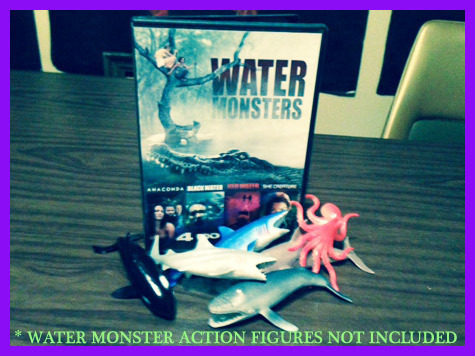 Who can blame me for trying to recapture that feeling of fleeting contentment by snagging yet another modestly priced four-movie collection from the fine folks at MILL CREEK entertainment called WATER MONSTERS!? Yay WATER MONSTERS! It’s not news that I love monsters and don’t even get me started on water! I don’t mean to go overboard but I sometimes think I couldn’t live without that stuff! Let’s say we take a closer look at this gift from God that you can probably find at your local Best Buy or Target or K-Mart or what have you. Maybe even Caldor? Does Caldor still exist? Come to think of it, one of the reasons I like these sets is that they remind me of the bins of mass-produced VHS tapes that they used to have at the center city Woolworths here in Philly back in the early nineties. That probably shouldn’t be a fond memory on account of that is how I was exposed to the abominations NUKIE and BOOGEYMAN 2 but fond it is. Aw, look the first movie is ANACONDA! Cool! You know, some people like to dismiss this flick because it’s called ANACAONDA and it concerns at least one ANACONDA but I’ve always enjoyed it and back in 1997, it was a wonderful B-movie throwback when there weren’t that many to be found. It really owes a lot to those beloved seventies-era disaster flicks with its extensive multigenerational cast and deliberate build-up. It’s got an agreeable epic journey vibe and I have to say the jungle location is actually convincingly oppressive. Yeah, yeah the CGI is dated but they don’t really take on anything too complicated and there’s a fair share of practical effects too. 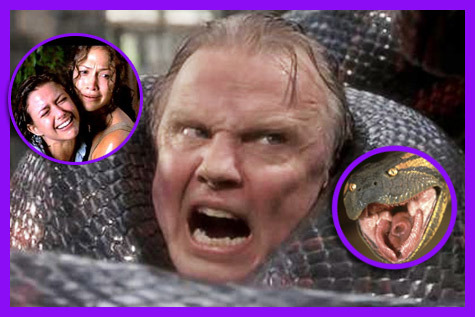 It’s simply a fun movie and JON VOIGHT’s off-the-rails performance alone makes it worthwhile. The weird thing is how likable and down to Earth JENNIFER LOPEZ is. This movie is so old it’s from before she became a phony-baloney media gadfly. I just realized I’m senile and the undeniable proof is that this movie that came out eight years ago, is in my mind, a recent release. Oh well, I certainly don’t mind having a hard copy of this effective Australian killer croc picture one bit. I’m not quite in the mood for a re-watch just yet, but the urge is bound to strike me one day in my limited future. Check me out unabashedly batting my eyelashes at this unassuming gem in a full review way back HERE. This, I’d say is the lone dud of the pack. There isn’t a whole lot to differentiate it from any other made for TV shark movie you might bump into. On the plus side, LOU DIAMOND PHILIPS and KRISTY SWANSON are present, so that might be fun if you don’t get depressed thinking about how likely they’re wishing they were anywhere else. I guess this one is good for people who don’t get the SyFy channel and want to pretend they do for an hour and a half. This is the one that sealed the deal for me. SHE CREATURE (listed on IMDb as MERMAID CHRONICLES PART 1: SHE CREATURE) was the first (and as I recall, the best and possibly the only worthwhile installment) of a CINEMAX series known as CREATURE FEATURES which consisted of original films inspired by preexisting AIP (American International Pictures) movie titles. It stars RUFUS SEWELL and CARLA “The lone member of TROOP BEVERLY HILLS who starred in a #1 movie the summer of 2015” GUGINO as an easy to look at carnie couple who kidnap and plan to exploit a mermaid who is far more formidable (and sympathetic) than she originally appears. So there you have it. What a deal! This cornucopia of slippery sharp-toothed water mongrels can be yours for cheaper than a bottle of Perrier. Moreover, and I swear I do not work for MILL CREEK, I just found out they have a new batch of affordable sets including a HAMMER FILMS COLLECTION featuring the used to be impossible to score SCREAM OF FEAR (!!!) 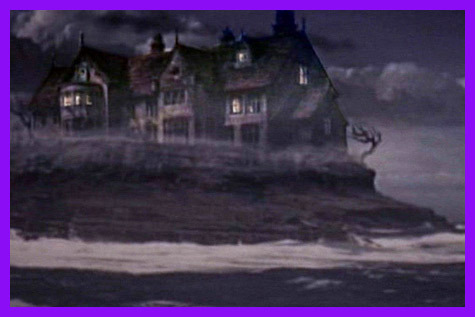 and a WILLIAM CASTLE COLLECTION with HOMICIDAL, and even the elusive THE OLD DARK HOUSE remake among other classics! That’s some slobber worthy cinema that won’t leave your poor wallet feeling defiled! These are all good finds! 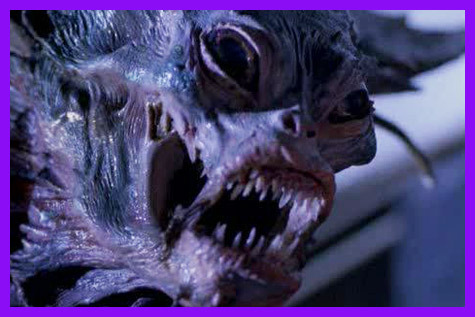 My favorite ‘water monster’ movies are the ‘underwater sea base attacked by creatures’ ones from the late 80’s, like Deep Star Six, Leviathan, Endless Descent, Lords of the Deep, The Alien Within. (Abyss doesn’t count – those aliens are friendly…dammit). johnnyblackout, you are speaking my language! I’ve always especially loved LEVIATHAN but this year I checked out DEEP STAR SIX again and it was so much better than I remembered. Now I love them both and they make a great double feature. I haven’t seen LORDS OF THE DEEP so I’ll keep an eye out for that one. Thanks! LORDS OF THE DEEP is a Roger Corman flick, and it’s pretty much a rip-off of The Abyss – but the aliens are cooler. I’d also throw the awesome DEEP RISING with Treat Williams into that mix. There’s a TV movie from decades ago called THE INTRUDER WITHIN, which has a water monster attacking an oil rig. It’s not bad. It’s hard to find, but probably on YouTube. 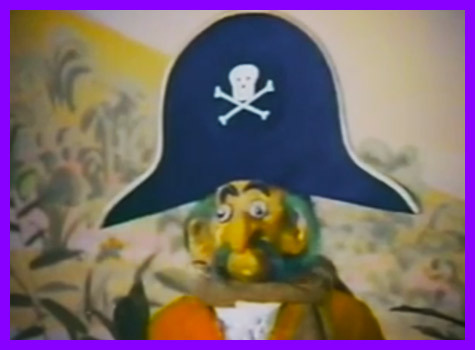 I wrote a spec script based on a British novel (John Halkin) called SLIME which was a killer jellyfish story. It didn’t go anywhere, but that’s a fun book if you can get a copy. It hurts me in the heart that you managed to review Anaconda without mentioning that it’s the first Ice Cube movie where he doesn’t plays a gangsta, and he almost manages to make it through the entire movie without saying “mother fucker”. I LOVE DEEP RISING! I saw an advanced screening of that before it came out and the audience went nuts for it and I’m so surprised it wasn’t a bigger hit. That’s a movie that I would have loved a sequel for. I always wonder what was on that island in the end. I remember INTRUDER WITHIN too. I used to have that giant clamshell box. I guess I left it at the video store I used to work at. SLIME sounds great. I would love to see something like that. I may have to track down that book! Yeah ANACONDA deserves a longer review. So much going on in it and so many great people in it. I think it really holds up rather well. Maybe Ill watch part 2 tonight. DEEP RISING came out at a bad time. I think it was a summer release, and it had to compete with much bigger films. Plus, Treat Williams wasn’t really a huge star to have on the poster. I think they wanted Harrison Ford, and he passed. It was originally titled TENTACLE and the original script was even BETTER than the movie (more SFX, bigger budget). But the flick rocks, I love that Touchstone rolled the dice and took a chance on it. I think if the movie was a hit, Deep Rising 2 would have been them dealing with mutated land creatures…maybe a Monster Island kinda thing.